How do I log in to CaneLink? Use a browser to access canelink.miami.edu. You will be prompted for your CaneID and password. If you do not have a CaneID, click here for more information. 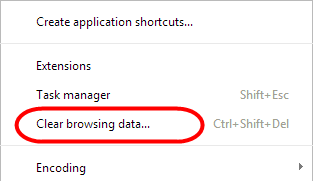 To determine your browser level when using Microsoft Internet Explorer, click on Help > About Internet Explorer. If you need help to upgrade your browser, you can contact the UMIT Service Desk at help@miami.edu or (305) 284-6565. It tells me I have an incorrect password. What do I do? First, verify that you are typing in your CaneID and password correctly. Remember that CaneLink is case-sensitive, and all characters must be keyed in correctly. If you are still getting the error message, then click on the "Forgot your CaneID or Password" link at caneid.miami.edu. For more information, go to the CaneID Help page. Click on the "Change your password" link at caneid.miami.edu You will then be asked to enter your security questions, and your old and new password. If you do not know the answer to your security questions or your password, or have not specified security questions, contact the UMIT Service Desk at help@miami.edu or (305) 284-6565. Where can I change the questions that CaneLink asks me when I've forgotten my password? Click on the "Change your security question" link at caneid.miami.edu You will be asked to log in prior to changing your security questions. I received a message that my account has been disabled. What do I do? If you've made too many consecutive unsuccessful attempts to log in to CaneLink, the system will disable the account as a security measure. To re-enable the account, click on "Is your CaneID disabled?" link at caneid.miami.edu You will be asked to answer your security questions prior to account reactivation. 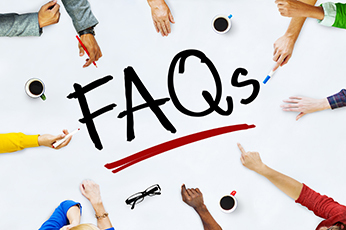 If you do not know the answers to your security questions, or you have specified your security questions then contact the UMIT Service Desk at (305) 284-6565 or send an email to help@miami.edu. If I don't use CaneLink for a while, I am disconnected and I have to log in again. Is there any way I can change this? For security purposes, CaneLink will disconnect users if they've been "idle" for a certain amount of time (20 minutes). To avoid being disconnected, occasionally change the page you're on while connected to CaneLink. 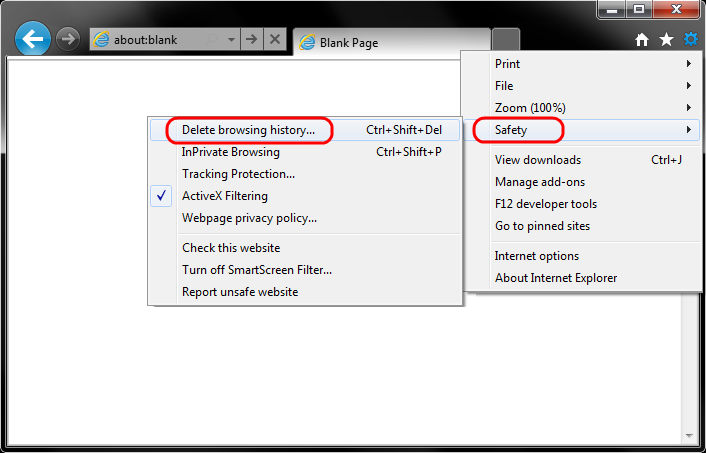 Additionally, be mindful of opening separate tabs for new windows in CaneLink. If one tab times out and is not closed, you may be disconnected from your session in less than 20 minutes. I received a message that I currently do not have access to CaneLink. What do I do? CaneLink delivers self-service functionality to students enrolled in classes offered in the schedule of classes (excluding some continuing studies programs), faculty members that are actively teaching courses, and parent delegates of student information. If you believe that you should have access to one of these, contact the UMIT Service Desk at help@miami.edu or (305) 284-6565. If you are looking to have access to administrative functionality in CaneLink, please fill out the form available here and send it to the office of the registrar. They will put you in contact with the CaneLink security personnel. You do not need to call the UMIT Service Desk. I am having a problem logging in and the error message includes an error number. What does this error number mean? In some cases you will need to contact the UMIT Service Desk in order to solve a problem that you are having logging on to CaneLink, because there is no action that you can take yourself in order to resolve the issue and a technician is needed. The error message that pops up in this case may include a number, for example Error Code 31012-5. This number will help the technician diagnose your problem more quickly. Please be sure to mention the number when you contact the UMIT Service Desk at help@miami.edu or (305) 284-6565. 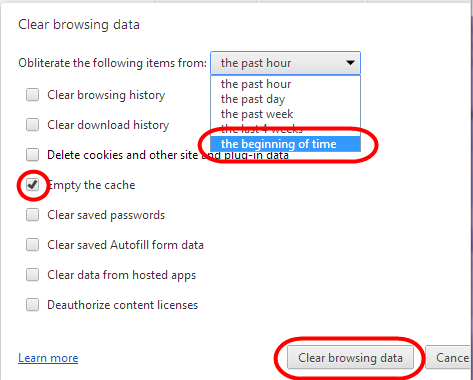 How do I clear cache on Google Chrome web browser? 1. 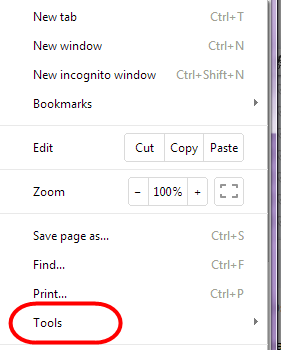 Click the Chrome menu icon on the browser toolbar. 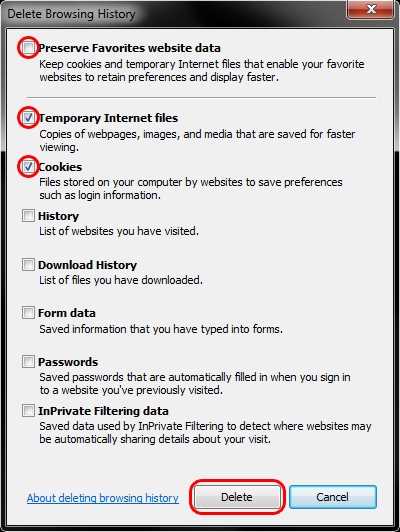 How do I clear cache on Mozilla Firefox? 2. Select the Advanced panel, Click on the Network tab, then in the Cached Web Content section, click Clear Now. 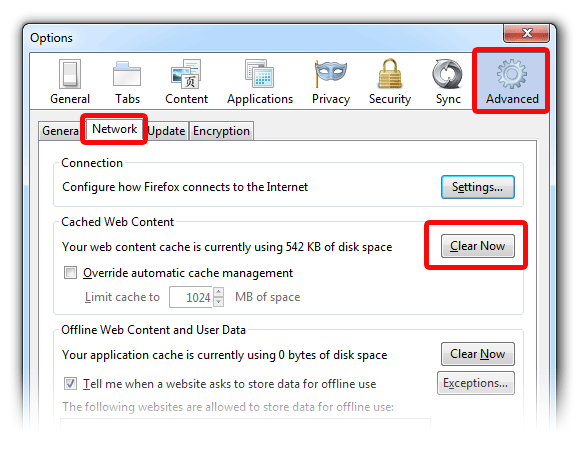 How do I clear cache and cookies on Microsoft Internet Explorer (version 9 and 10)? Can I use my IPad or mobile device with CaneLink? Yes you can, but CaneLink was not designed for mobile devices, so response time may be a bit slower. Do I need to have cookies enabled? Pop-ups enabled? Set "Firefox will" to "Use custom settings for History"
Click on the icon on the far right of your browser "Display a menu of general Sarfari Settings"
Why do I get a message saying that CaneLink is currently unavailable? There are times when CaneLink must be taken offline for maintenance. 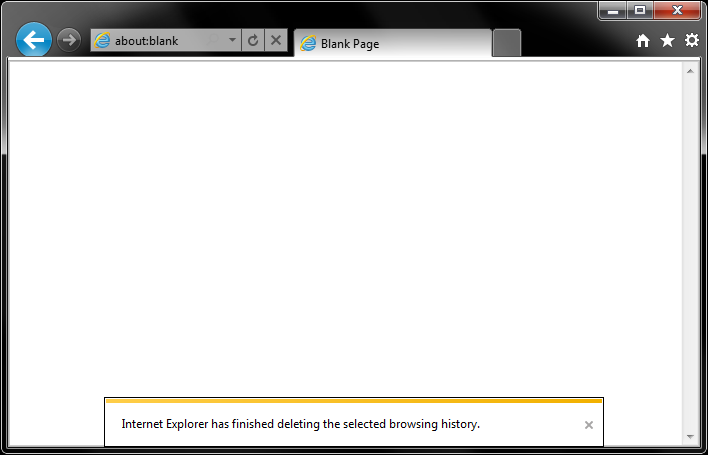 When this occurs, anyone logged on to CaneLink will see this message. The message may also indicate when CaneLink is expected to be available. When you see this message it is not necessary to call the UMIT Service Desk as this indicates a planned outage. I am clicking on a link and nothing happens. What can be wrong? 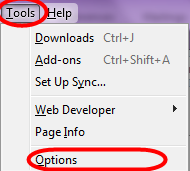 You need to enable pop-ups on your browser. Enabling pop-ups is different for each browser. How do I get a person to help me with the problem that I am experiencing with CaneLink? Please contact the UMIT Service Desk at help@miami.edu or (305) 284-6565.
Who can get a CaneID? A person does not need an UM affiliation to get a CaneID, however, systems only recognize the CaneID accounts that they specify, and that you are granted access to. As a CaneID-holder, what are my responsibilities? Do not share your challenge/response with anyone. treat your CaneID/Password/Challenge/Response as the keys to your digital identity. The Identity and Access Management (IAM) team is operated out of UMIT, as well as the UMIT Service Desk at help@miami.edu or (305) 284-6565, is the primary liaison to the general campus community. While the service desk cannot create or set the password for a CaneID, they can send service tickets to the IAM team to resolve greater concerns. Are there different kinds of CaneIDs? No. CaneID will sign you in to any and all of the applications that the university uses. Is it okay to have more than one CaneID? No. If you are aware of more than one CaneID linked to your information, contact the service desk to have them merged into one account. I was given a "CaneID" but I have never used it, and I don't know the password. CaneID's are automatically generated for you, with a default password that specifically corresponds to your personal information. In the same communication (email or letter) that you received your CaneID, you should have been given the formula for a default password. If you have not seen this communication, or have since lost it, please contact the UMIT Service Desk at help@miami.edu or (305) 284-6565.